Obituary – Edwards, Joann Marie (Pricer) « Perry High School Alumni Association, Inc.
Joann Marie Pricer Edwards, 75, of Perry, Oklahoma, was born on August 31, 1938 in Perry, Oklahoma to Willie Oswald and Lydia Tolsdorf Pricer. She passed away on Tuesday, November 12, 2013 at Mercy Health Center in Oklahoma City, Oklahoma. She was born, raised and lived in Perry her whole life, except for a few years after marriage. 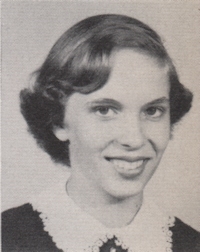 She was a member of the Perry High School Class of 1956. Joann married her sweetheart, William Bill Martin Edwards at St. Rose of Lima Catholic Church in Perry, Oklahoma, on September 29, 1956. Bill preceded her in death on November 16, 2000. She spent many years as a delivery driver for OReilly Auto Parts. Although Joann was well known in the community, it was through her job that she had the opportunity to make many good friends. She worked for OReillys from April 1, 1993 until her retirement in 2007. Joann took much pride in raising her four children. She worked very hard at being a loving mother and grandmother. She loved her family dearly. She enjoyed many hobbies, including sewing, gardening and watching the Oklahoma City Thunder. Most of all, she loved spending time with her family. 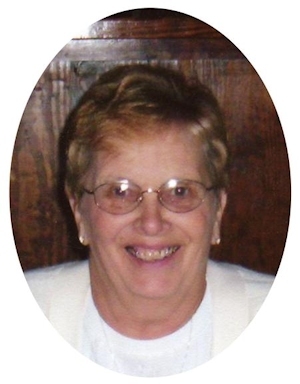 She was a lifelong member of St. Rose of Lima Catholic Church. Family will receive friends from 5:00 p.m. to 7:00 p.m., Friday, November 15, 2013 at St. Rose of Lima Catholic Church in Perry, Oklahoma. Rosary will be held at 7:00 p.m., Friday, November 15, 2013 at the St. Rose of Lima Catholic Church in Perry, Oklahoma. Mass of Christian Burial will be held at 10:00 a. m., Saturday, November 16, 2013 at St. Rose of Lima Catholic Church in Perry, Oklahoma. Rev. Dan Letourneau will officiate and assisted by Rev. Mariyanandam Mario Pulugujju. Interment will be at St. Rose of Lima Catholic Cemetery in Perry, Oklahoma. Services are under the direction of BrownDugger Funeral Home in Perry, Oklahoma. Memorials may be made to the Oklahoma Medical Research Foundation in care of BrownDugger Funeral Home, 1010 N. 7th Street, Perry, Oklahoma 73077. Joann is survived by three sons, Terry Edwards and his wife, Robin of Guthrie, Oklahoma, Randy Edwards and his wife, Dana, Scott Edwards and his wife, Vickie both of Perry, Oklahoma one daughter, Cindy Rice and her husband, Larrie, of Perry, Oklahoma nine grandchildren, Jeremy Edwards and Jason Rice and his wife, Desi, both of Guthrie, Oklahoma, William Glen Edwards and his wife, Kailene of San Diego, California, Rusty Edwards of Oklahoma City, Oklahoma, Chris Edwards and his wife, Tracey, and Michael Edwards and his wife, Meagan, both of Perry, Oklahoma, Brandice Edwards and Jim Nix of Bethany, Oklahoma, Amanda Rice Wilson and her husband, Kyle, and Shauni Edwards, both of Perry, Oklahoma six greatgrandchildren, Jace Allen Edwards of Edmond, Oklahoma, Daelon Royal Rice, Jaxton Kenneth Rice, both of Guthrie, Oklahoma, Addilyn Richelle Edwards, Kade Walker Wilson and Ava Grace Wilson, all of Perry, Oklahoma one brother, Pat Pricer of Pittsburg, Texas. She was preceded in death by her husband, Bill parents, Willie and Lydia Pricer son, Bobby Wayne sister, Willene Shultz grandparents niece, Jennifer Shultz and nephew, Rob Shultz.